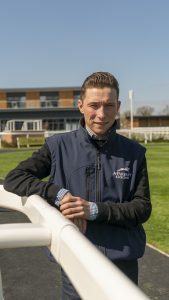 I am delighted to have been offered the role as Newbury Racecourse ambassador for the 2019 Flat season. It’s a great racecourse to be involved with, a high-class racetrack which always attracts many of the best horses, trainers and jockeys. I am really looking forward to riding at the course this weekend when we will start to see some future stars emerge for the Flat racing season. It’s a great thrill to be part of both days of the Dubai Duty Free Spring Trials Weekend. I have recently become stable jockey to Roger Charlton and hopefully will be in action at the track a lot over the season. It is a favoured track of Mr Charlton’s. Part of my role here will be to represent Club 24 Membership and as I am only 18 myself, I will use it as an opportunity to introduce the sport to more people my age. Hopefully I can relate to what we want to see and get involved with, including behind the scenes visits as well as gallop trips, so it should be fun. Its seriously good value – 29 racedays for £120, that’s under £5 a go! I couldn’t have wished for a better season last year. To ride 111 winners, to win the Flat apprentice championship, as well as win the Stewards Cup and ride my first Group 1 winner was the stuff of fairytales. I never thought it would develop the way it did. I don’t feel any pressure to repeat that this season, but obviously I do hope I can and I will be striving to deliver winners for my new boss Roger Charlton as well as many winners as I can for as many other stables as I can. The year didn’t start too well as I broke my back and neck in a fall at Kempton in January. I spent a lot of time rehabilitating at Oaksey House to keep my fitness up while also resting the fractures. As a result I did not lose much fitness and hardly put on any weight. I have been able to come back feeling fit, better than before almost. Shortly after my return I was able to win the Rosebery Handicap on Forbidden Planet for Mr Charlton and finish second in the Listed Magnolia Stakes on Extra Elusive who was 20-1. It was a good way to kick off the new job. I hope we can continue like that throughout the season. He’s a nice horse. He showed that last year when he won at Newcastle and got beat by quite a nice Godolphin horse next time out at Kempton. Mr Charlton kind of half blames himself for running him back a bit too quickly. He seems to have strengthened up over the winter and matured nicely. It’s going to be a tough race, as it always is, with some nice horses in there but hopefully he is one of the nicer ones. She ran at Newbury last year and ran well. She seems to have improved over the winter and strengthened up quite nicely. It’s hard to know until they get out there but we will soon find out more. She looked like she lacked experience and needed time to strengthen on her debut. She is by Camelot so should stay a mile and a quarter and appreciate the ground as well. It is her first start and she has an appealing pedigree so I hope she can show promise for the future. He won first time out last year and won a Listed race at Goodwood. He finished third in a decent race at Newbury on his last start. A mile and half seems to suit and the softer the ground the better. It’s quite a hot race so we will see where we are with him. He showed quite he could be quite smart when he won at Sandown, beating a horse of Sir Michael Stoute’s. He ran creditably afterwards and I would like to think he can do so again over a trip and ground that will suit. He has run twice. He seemed to need experience last year and improved quite nicely from his first to his second run in a race won by quite a nice horse. I think the track will suit him. This is his debut. He is bred to stay further and hopefully he can show some sort of ability for a stable I ride quite a bit for. Jason Watson will be providing regular blogs across the season, plus much more. For further information about Club 24 or any upcoming fixtures, visit newburyracecourse.co.uk or call 01635 40015.